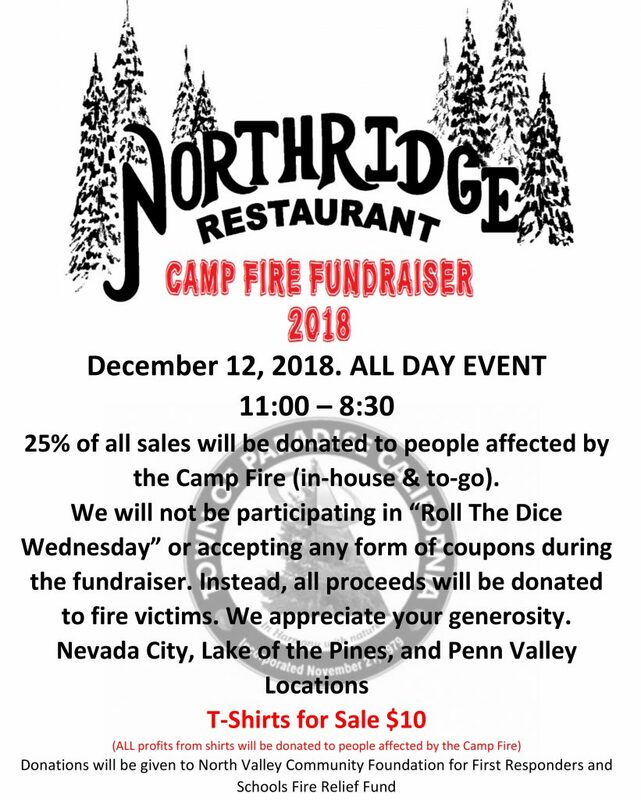 The Northridge Restaurants are proud to announce that all 3 locations: Nevada City, Penn Valley, and Lake of the Pines, will be hosting a fundraiser for the victims of the Paradise Campfire on Wednesday, December 12, 2018. We will be donating 25% of our sales. It is an all day event, from opening at 11:00am to closing at 8:30pm. The funds will be going directly to the North Valley Community Foundation, to support their First Responders and Schools Fire Relief Fund. Please help support the cause by enjoying some delicious Northridge food! Both dine-in and take-out will apply! We will not be “Rolling the Dice” or taking any coupons that day, so we have more to donate to the victims of this terrible disaster.